A review of a variety of indicators point to a market which is still quite dysfunctional. On one level, the market is underpinned by a strong buoyant economy with notable demographic pressure driving demand. However, for a variety of reasons, such factors are not impacting the market as one would expect in a normal housing market. Firstly, a review of the latest transaction data reveals a moderate increase in the quantity of properties transacting over the twelve month period during 2015. Approximately 48,200 properties transacted during the year, including multi-family transactions, with an approximate value of €10.7 billion. This is an annual increase of 10% on sales nationwide. However, it is worth noting that activity did slow during the year, with 12% reduction in transactions in the fourth quarter compared to the same period in 2014. Secondly, supply levels have continued to diminish with further erosion in the quantity of properties available for sale in January 2016. The bi-annual analysis of stock presented a total of 26,800 units for sale. 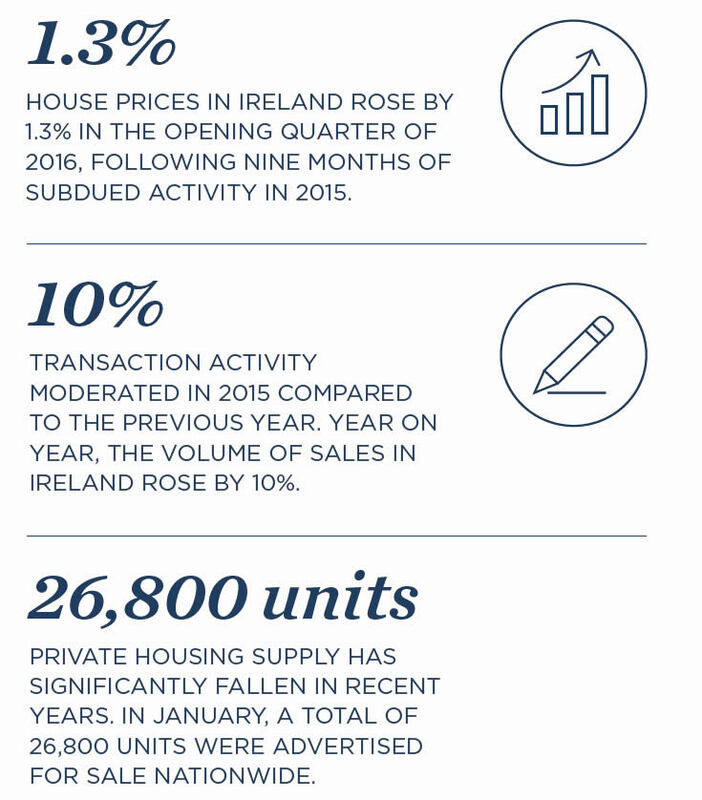 This is a 13% decrease from January 2015 and represents only 1.4% of the private housing stock. Furthermore, the mismatch between the quantity of investors buying residential property and those leaving the market persists, with approximately two investors leaving the market for every one investor buying a property. This continues to place significant upward pressure on rents. Finally, it is worth noting that the market did enjoy uplift in price performance following a more moderate level of price growth during the latter months of 2015. Average values nationwide grew by 1.3% in quarter one, according to the Sherry FitzGerald barometer of property prices. This is a notable uplift from previous subdued quarters; however, it is still marginally lower than the comparable period in 2015. The Dublin market, which cooled significantly during 2015, regained some modest growth during quarter one with the average value of property in Dublin increasing by 0.7%, up 1.2% year on year. Excluding Dublin from the national figure, the quarterly growth figure was 2%, with an annual growth rate of 6.8%. Next Next post: Top 5 Things to do in Rathfarnham!